The planning for the International Year of the Salmon has started! Do you have any ideas for events, activities, programs or partnerships? raise awareness of the critically endangered Atlantic salmon and their varied ecosystems as well as the significant challenges and opportunities of what we can do better. raise awareness of the cultural, historical, social and biological importance of the critically endangered Atlantic salmon within and beyond Maine. support organizations and their continuous conservation and restoration efforts. 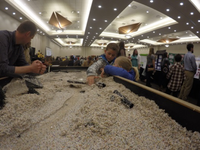 invigorate a new generation of scientists, managers, policy makers, educators and conservationists to continue the work needed to conserve and restore salmon and their varied ecosystems. 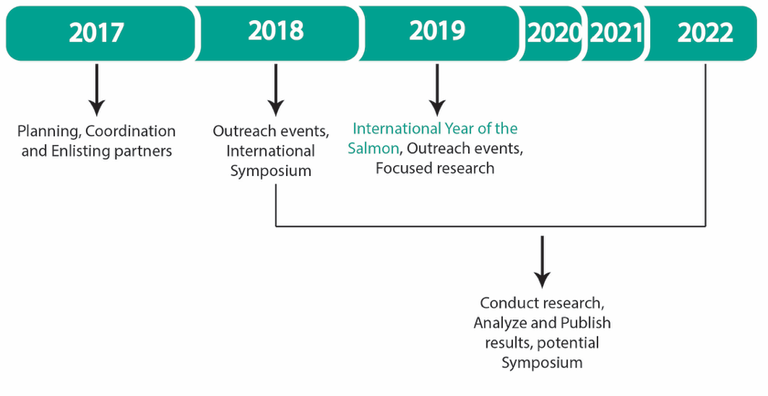 The International Year of the Salmon will stimulate an investment in research and be a catalyst for information to support the fast pace of management for salmon and their ecosystems. It is an opportunity to enhance and establish new partnerships and collaborations, to learn from others as well as promote and highlight the Atlantic salmon programs in Maine. The International Year of the Salmon is not just one year. 2017-2018 will entail planning, promoting and enlisting partners. The International Year will be launched with a Symposium late in 2018 followed by a burst of outreach, education and focused research activities in 2019. Efforts made in outreach and education will continue and research will be analyzed. In 2022, the results from the research will be communicated widely. There is also the potential for a symposium to discuss the research results as well success stories and lessoned learned from outreach and communication efforts. For a global perspective, visit the North Atlantic Salmon Conservation Organization or the North Pacific Anadromous Fish Commission.